A selection of responses to ARC's work from the media worldwide. Scroll down for international media coverage. Religious leaders in Nairobi National Park pray by the charred remains of elephants killed by poachers. 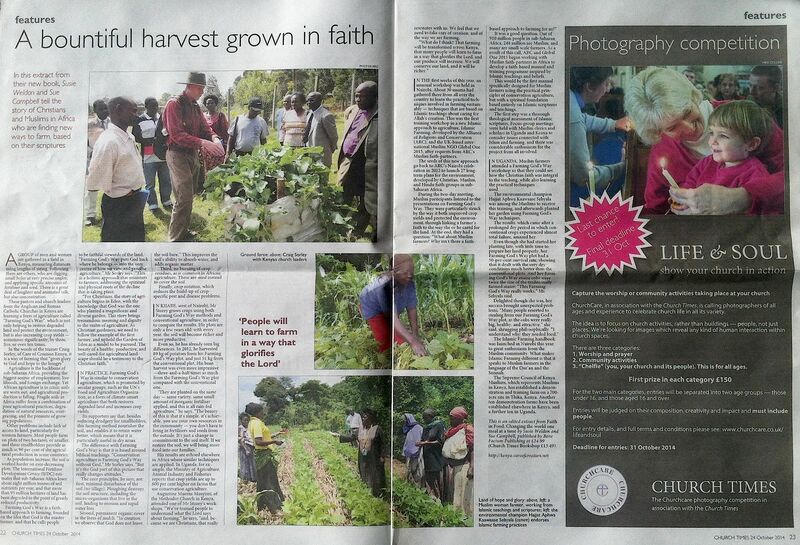 September 28, 2012: A short feature in the UK Church Times reported on ARC's Nairobi gathering ('Many Heavens, One Earth, Our Continent") and the WWF/ARC joint press conference about faith groups' commitment to combat the illegal trade in endangered species in Africa. You can read the article here. July 24, 2012: UK Daily Telegraph column by Geoffrey Lean used the Sacred Land book and a related interview with Martin Palmer to explore Bristol's sacred landscape. You can read the article here. March 09, 2012: The UK Church Times published an interview of Martin Palmer with author Nick Mayhew-Smith, who has himself published a guide to the '500 Holiest Sites in England', about the significance of 'Sacred Land' As well as explaining the key ideas behind the book, the feature makes specific reference to the success of ARC's 'Living Churchyards' project in creating a haven for wildlife and flowers in 6,500 churchyards across Britain. You can read the full article here. The March 2012 launch of Martin Palmer's new book caught the eye of the BBC. February 27, 2012: A long interview with Tom Levitt posted on the website of The Ecologist magazine in which Martin Palmer explains the long history of man-made ecological collapses - Northern Europe has experienced four already, starting in 3,000BC - and the implications of a fifth that could be brought about by current unsustainable use of resources. You can read the interview, in which Martin also explains the significance of a spiritual approach to nature, here . February 20, 2012: 'Sacred Land' on BBC Radio 2 The newly-launched book by Martin Palmer, Secretary General of ARC, received an unexpected 'plug' when BBC Radio 2 presenter Aled Jones said that it "sounds absolutely fascinating". Martin has been a guest on Jones' 'Good Morning Sunday' programme on several occasions and the broadcaster told his 8 million listeners all about the book, which shows how there are coded spiritual designs hidden beneath modern British cities, and its origins in a chance conversation between the author and a Russian Orthodox priest. For more about 'Sacred Land' click here. January 31, 2012: BBC Radio 4 'Beyond Belief'. Following BBC coverage of the Green Pilgrimage Network launch in 2011, ARC Secretary General Martin Palmer was one of three guest speakers invited to discuss the phenomenon of pilgrimage on Radio 4's 'Beyond Belief' programme. During an entertaining discussion programme he was able to raise many of the issues around sustainability and pilgrimages that underpin the Green Pilgrimage initiative. The programme is available to be listened to on the BBC website - click here to hear it. November 4 2011: Widespread coverage of Assisi event The 25th anniversary of the 1986 Assisi conference and WWF's 50th birthday were celebrated by a return to the Italian town for the 'Sacred Land' conference which launched the Green Pilgrimage Network. The event was covered by an extensive article in 'The Tablet' (Catholic publication) and further articles in The Church Times (Anglican publication), Jerusalem Post, The Hindu and Times of India. There was very widespread web coverage on sites ranging from the purely environmental (treehugger.com, greenprophet.com, ecosikh) to the religious (Vatican Radio) and mainstream news (CNN). The sheer scale of pilgrimage worldwide definitely caught the media's imagination. A summary report of all the media coverage can be downloaded here. November 3, 2009: Major coverage of Windsor event The three-day 'Many Heavens, One Earth' event, organised at Windsor by ARC and UNDP, attracted major coverage both nationally and internationally. The event was attended by UN Secretary General Ban Ki-Moon who told assembled representatives of the world's religions: "You are the leaders who can have the largest, widest and deepest reach" when it comes to warning about climate change and he urged them to encourage Governments to "act more boldly" in protecting people and the planet. The Economist (November 07, 2009) and The Guardian (November 03, 2009) both published significant articles about the conference, as did the China Daily, The Hindu and many other publications worldwide. January 28, 2009: The Guardian newspaper published a column about religion in China which quoted extensively from ARC’s work in that area. Written by philosopher and writer Mark Vernon, the article featured an interview with ARC’s Secretary General, Martin Palmer. It described ARC as “one of the few outside organisations that have a license from the Chinese government to work with religious groups in the country.” Link here to read ARC's news item on this. Link here to read the Guardian article. And link here to learn about the Daoist Eight Year Plan introducing Generational Changes to protect the environment, created in October 2008. June 18, 2008: The Guardian article about "The Pope of Hope", His All Holiness, Bartholomew I, Archbishop of Constantinople, New Rome and Ecumenical Patriarch, features ARC and our sister organisation, IFEES. Fazlun Khalid, now Director of the Islamic Foundation for Ecology and Environmental Sciences, " ...is recognised as an expert on ecology from an Islamic perspective". Formerly working as a Director of Training with ARC, and a WWF Consultant, Fazlun commented: "As the guardians of Allah's creation we have a responsibility to protect the environment. In our eagerness to 'progress' and 'develop' we have lost sight of the finite and delicate nature of planet Earth and of humanity's place in it." Link toThe Guardian to read about the work of the leader of the Orthodox Church to promote environmental care. January 2008: BBC Radio 4 debate Martin Palmer, ARC's Secretary General took part in a Radio Four debate about "Cultures of Apocalypse". Link here for more details of this debate. September 2007: The Economist article on Palk Strait ARC was featured in an Economist article on faith leaders and ecologists combining forces to protect the Palk Strait between India and Sri Lanka. It was one of two stories about faiths and conservation in The Economist within a month: the other, on October 6th, was a story about Parsi/Zoroastrian involvement in raptor protection programmes. Link here for that story. April 2007: The Guardian feature on Vatican conference The UK newspaper published a major feature on the Vatican conference on climate change, being held that week. Correspondents John Vidal and Tom Kington highlighted how the Vatican had added its voice to a rising chorus of warnings from churches around the world that climate change and abuse of the environment is against God's will, and that the Catholic church, with its one billion believers, must become greener. ARC was invited to comment on how the Catholic church is just one of several faith groups that are rapidly moving environment to the fore of its social teachings. "Climate change, biotechnology, trade justice and pollution are all now being debated at a far higher level by the world's major religions," ARC's Martin Palmer was quoted as saying. May 2005: Article in The Times "The Alliance of Religions and Conservation is a charity that brings together conservationists and members of living faiths which have a tradition of revering the natural world. It works in concert to protect hallowed plants, animals and habitats — spirituality and science for once making common cause". Mark Griffiths, The Times , May 21, 2005. September 21, 2012: Widespread coverage of wildlife programme Following the on-line publication by CBS News of "Can religion save Africa's elephants and rhinos?" versions of the piece appeared on countless websites, especially in the US. The article had been written by Associated Press reporter Jason Straziuso after he had attended ARC's environmental conference Many Heavens, One Earth, Our Continent' in Nairobi. The conference launched 26 long-term environmental commitments from African faith groups and ended with a press conference at which ARC and WWF announced a collective initiative by the 50 religious leaders attending to work to halt the illegal trade in endangered wildlife species from Africa. March 1, 2012: University of Minnesota magazine interview Interview with Martin Palmer by Greg Breining, asking "What would it take for faith communities to become leaders in solving global environmental challenges?". November 4 2011: Extensive coverage of Assisi eventThe 25th anniversary of the 1986 Assisi conference and WWF's 50th birthday were celebrated by a return to the Italian town for the 'Sacred Land' conference which launched the Green Pilgrimage Network. The event was covered by an extensive article in 'The Tablet' (Catholic publication) and further articles in The Church Times (Anglican publication), Jerusalem Post, The Hindu and Times of India. There was very widespread web coverage on sites ranging from the purely environmental (treehugger.com, greenprophet.com, ecosikh) to the religious (Vatican Radio) and mainstream news (CNN). The sheer scale of pilgrimage worldwide definitely caught the media's imagination. A summary report of all the media coverage can be downloaded here. October 29, 2011: China Digital Times article A historic Daoist conference attended by Martin Palmer (ARC Secretary General) stimulated an in-depth article by Ian Johnson in the New York Review of Books which was reported in the China Digital Times (October 29, 2011): "The meeting was held near Mt Heng in Hunan province, one of Daoism's five holy mountains, and was attended by 500 participants. It received extensive play in the Chinese media , with a noted British Daoist scholar Martin Palmer getting airtime on Chinese television. This is a sharp change for a religion that was persecuted under Mao and long regarded as suspect." The text of Mr Johnson's article is available to download as part of a full report on media coverage of the International Taoist Forum here and you can view Martin Palmer's appearance on Chinese TV CCTV4 here. November 3, 2009: Widespread coverage of Windsor event The three-day 'Many Heavens, One Earth' event, organised at Windsor by ARC and UNDP, attracted major coverage both nationally and internationally. The event was attended by UN Secretary General Ban Ki-Moon who told assembled representatives of the world's religions: "You are the leaders who can have the largest, widest and deepest reach" when it comes to warning about climate change and he urged them to encourage Governments to "act more boldly" in protecting people and the planet. The Economist (November 07, 2009) and The Guardian (November 03, 2009) both published significant articles about the conference, as did the China Daily, The Hindu and many other publications worldwide. August 2008: Jakarta Post column on faith and ecology "Of course, not everybody will automatically turn into an environmentalist if they understand a little ecology or learn that caring for the environment is a religious duty. However, if environmental conservation is publicly understood to be a religious duty, it will be much easier for conservation workers to do their job." Link here for a column in the Jakarta Post, August 2008, urging religious leaders to get more involved in the environment. June 22, 2008: The Star (Malaysia) article An article in Malaysia's The Star newspaper on July 22, 2008 singles out ARC's work as a good initiative working with a range of religions on key environmental issues. The article, entitled “Be agents of change” by Star reporter Soo Ewe Jin, describes the work of Christian conservation organization, A Rocha. Quoting its upcoming chairman, botanist and ecologist Sir Ghillean Prance, saying: "We will only achieve the major changes needed in our lifestyle if it is backed up by religions.” Link here for the full article in the Malaysia Star. June 11, 2008: The Times-Herald article on religion and conservationThe Times Herald features the new partnerships forged by the United Nations with religious communities... And uses ARC's work as a major example. (This article was originally published in One Country, The newsletter of the Baha'I International community, and was republished in the Times Herald, on July 4, 2008). "UNITED NATIONS - With words like "peace," "dialogue," and "cooperation" salted through its agenda, the program for a special hearing of the General Assembly last autumn might have been any of a thousand meetings here. But what made the 4-5 October 2007 "High-Level Dialogue and Informal Interactive Hearing with Civil Society on Interreligious and Intercultural Understanding and Cooperation for Peace" different was the degree to which a new actor was spotlighted before the UN's most globally representative body. That new actor was religion - or, rather, people who directly represent religious communities from around the world. ..."
"A new collaboration/partnership between the UN Development Programme (UNDP) and the Alliance of Religions and Conservation (ARC) to better involve world religions in addressing climate change and specifically to help religions develop concrete programs of action to slow global warming. ..."
"The UNDP's new initiative with the ARC on climate change aims also at concrete action. Under the terms of that initiative, Baha'i, Buddhist, Christian, Taoist, Hindu, Jain, Jewish, Muslim, Shinto, Sikh and Zoroastrian leaders will be invited to commit their communities to projects that address climate change and the protection of the natural environment in "practical ways"--from "forestry conservation to organic farming schemes to introducing, promoting and financing alternative energy sources," according to the ARC". Link here to read the full article. July 7, 2008: Time magazine article on solar power in Indian temples "India's faith-based organizations are also helping spread the gospel of green. The UK-based Alliance of Religions and Conservation, which works with the UN to involve religious groups in environmental outreach, is working on a conservation campaign in the holy city of Vrindavan, as well as pushing India's 28,000 Sikh temples to convert their kitchens to green technology. The combined potential of such efforts is limitless. India's religious groups have sizable incomes, own vast amounts of land, and have enormous influence on public opinion through their educational institutions. Indeed, with 99% of Indians professing to one faith or another, the country's green movement might not have a prayer without them". Link here to read the article from the July 2008 Time Magazine about the use of solar power in India's temples and the ARC's contribution in encouraging the faiths in their environmental efforts. April 2008: America's National Public Radio (NPR) broadcast a major feature on ARC's work as part of its acclaimed series on climate change in April 2008. The feature includes a series of interviews with ARC's secretary general Martin Palmer, talking about the religions' major role in combatting climate change and helping the natural environment as well as a little about his own journey. Link here for the NPR story and to listen to the broadcast. January 2008, CNN.com credited ARC as a resource for an article on "Religion and the Environment". Link here for the full feature. October 2007: Toronto Globe and Mail article on Catholic eco-action In 2006, ARC participated in an environmental audit project with Benedictine nuns. This resulted in the publication of a successful environmental handbook which has been translated into Spanish, Portuguese and English. In October 2007 Eric Reguly, the Rome correspondent for Toronto's Globe and Mail, wrote an article on Catholic eco-action and the handbook. He commented, "... last year, the Benedictine Sisters in Erie, Pa., published a 200-page document called Listening to the Earth: An Environmental Audit for Benedictine Communities. Financed by the World Bank [in partnership with ARC], elegantly written and impeccably researched, it discusses the sources of pollution and offers suggestions on how to cure or reduce them, right down to what to make of white smoke from a diesel engine ("faulty fuel-injection system")". Link here for more details on Catholic eco-action and the Benedictine Handbook. July 2008: Bath Chronicle article ARC helped launch an appeal to raise £125,000 for improvements and maintenance for St Mary's Church in Bitton. Martin Palmer from ARC spoke about the historic importance of the church and its Saxon origins. Link here for the Bath Chronicle article about ARC and the appeal. April 2008: BBC Bristol article on debate Bath Abbey hosted a Climate Change Debate in April 2008. BBC Bristol commented: "Martin Palmer, Director of the Alliance of Religions and Conservation, is well-qualified to answer the question of whether religion is a help or a hindrance in responding to climate change". Link here to see the rest of the article. August 13, 2007: Western Daily Press article "ARC acts as a bridge between the two worlds [of nature and faith]" Susie Weldon, Western Daily Press, Bristol, 13 August 2007. Link here to download the full article as a pdf file (2.5MB). Link here to see Videos and Podcasts on Religions and the natural Environment. The worlds leading Anglican newspaper joined one of the UK’s most influential daily papers in publishing a feature article about the ISE conference organised jointly by ARC and Jinja Honcho, the Association of Shinto Shrines. We don't like to brag but ... plenty of people have been very complimentary about our newly published book. Read what they say here. "Bright new light on ancient ideas"